In India after the winter season, arrives the spring season when everywhere we can see blossoming of colorful flowers, indicating the arrival of Holi. On the day of 2019 only a little sight of Solar Eclipse will be visible. The eclipse will be seen on Earth. There is a tradition of observing Bhawani fast on Chaitra Shukla Paksha. In the year 2019, this fast will be on 13th April. Goddess Bhawani appeared on this day. Pujan should be offered in a systematic manner. According to the scriptures, Naag Panchami is celebrated on Panchami Tithi of Shukla Paksha in Shravan Maas. Apart from this, snake is the God of every month’s fifth date. Raksha Bandhan is the symbol of unbreakable bond between the love of brother and sister, beyond any religion or class. The festival of Basant Panchami is celebrated on fifth day of Shukla Paksha of Magh month. This year, the festival will be celebrated on 9/10 February 2019. The sun in Vaishakh Sankranti will start in the Aries sign on 14:08. Vaishakh Sankranti will fall on 14 April 2019 will be 15 Muhurati. During this time Snaan Daan will be begin after 07:44 am and will stay for the whole day. In 2019, the Shardiya Navratra poojan is beginning on 29 September, Pratipada of Ashwin Shukla Paksha. There is hasta Nakshatra, brahma Yoga, on this day. This day holds great importance for the devotees of Mata Sharda. Observing Navratra fast for nine days with all the rituals blesses the person with virtue. 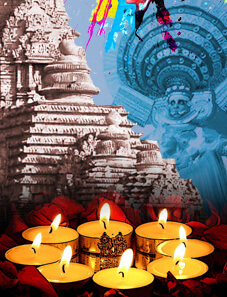 Fast of Mahashivaratri is very significant for devotees of lord Shiva. This festival is celebrated on Trayodashi of Falgun Krishna Paksha. In the year 2019, this auspicious fast will be on 4th March. Ashwin Shukla Paksha brings the auspicious Navratri with it. On Dashmi, Dussehra festival is celebrated with full joy and enthusiasm in the whole country.